Reviewing excellent e-liquid like Moon Sugar, Sweet Lovin, and Melon Head, from Mr. Good Vape, is a task this team lives for. 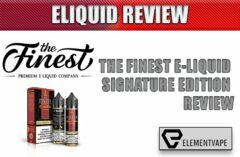 As much as we loved Mr. Good Vape last year and the year before, there have been many changes since, and what were delicious and satisfying ejuices before, are even better now. So let’s get into this new look at the new Mr. Good Vape. Gary Riddle, one of the owners and founders of Mr. Good Vape, has taken over the production of his (and ours) most loved three flavors mentioned above. Moon Sugar, Sweet Lovin, and Melon have been reformulated, using Flavour Art extracts, Nic Salts, and all blended to 65%/35% VG/PG, except for Moon Sugar, which is an 80/20 blend… these new liquids perform amazingly well in every sub-ohm tank we’ve used so far. “A supreme mixture of the world’s best strawberry and watermelon candies cut with a smooth bubblegum. Sweet Lovin reminds the senses of a childhood summer in the old neighborhood. This flavor takes all of the goodness of hard and soft candies, effortlessly combining them into a mellow flavor and texture of mouthwatering bubblegum. 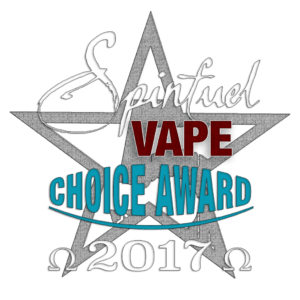 Julia: Like everyone else here at Spinfuel.com, I’ve been using the new Valyrian tank from Uwell for my everyday vaping. Terrific flavor fidelity and enormous clouds, the Valyrian is a major hit with power-vapers, and the perfect tank to try out all three of the Mr. Good Vape’s new formulations. Sweet Lovin’s official flavor description is pretty much spot on. We all vape 3mg nicotine blends, and truth be told, the new Nic Salts don’t affect the flavor fidelity, but for some reason I found 3mg in these blends to be a bit more satisfying. That means that the 100mL bottles last a little longer because I’m not over-vaping to make sure my nicotine urges are sated. Tom: I love the flavor blending here in Sweet Lovin, and the 65% VG is clean, fresh, and builds massive clouds while allowing great flavor too. I’m not a complete fan of the flavor profile, but for those looking for the best strawberry/watermelon candy bubblegum vape, this is definitely it. I vaped a couple of sub-ohm tanks for all three flavors, the Uwell Valyrian (a top choice tank), and the Vaping AMP Tanker. Though both tanks are not cheap (oh how I wish I could buy them at wholesale!) they are the best tanks to discover the true value of an eliquid. Sweet Lovin provided an excellent vape experience, but one that I won’t add to my rotation simply because the flavor profile is not me. Keira: Strawberry and Watermelon, wrapped in a candy flavoring, and mixed in a bubblegum layer of flavor makes Sweet Lovin both delicious to vape, and very complex at the same time. I love it and I’ve added it to my rotation. However, I must admit that even if I didn’t love it as much as I do, I would still add it because 19 cents per mL for quality like this, how could I not? “A tantalizing mixture of a freshly baked sugar cookie, warm butterscotch and toasted graham cracker that will have you floating on the moon. Moon Sugar encompasses the rich and bright flavor of the perfect dessert vape. Perfect for those cloud chasers who want to blow clouds without sacrificing flavor. Whether you drip it or throw it in a tank, Moon Sugar never disappoints. Julia: Everyone who has been vaping for more than a year or two knows about Moon Sugar. 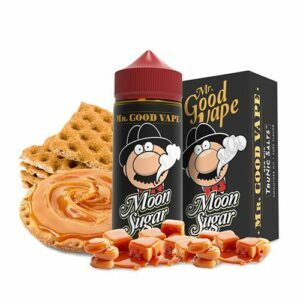 Moon Sugar put Mr. Good Vape on the map, and now its back and better than ever. The official description above makes Moon Sugar look like the most decadent, sweet confection e-juice imaginable, and it almost is. Fortunately, delivering all the flavor as promised, it does so without making you want to switch out to a less-sweet flavor an hour later. 2017’s Moon Sugar has the same awesome flavors, but with 80% VG, these flavors are offered less forcefully, and it is way more satisfying. Tom: Moon Sugar was always an eliquid I enjoyed, but not one that I loved. I thought the flavor profile was a winner, but the concentration of flavor was a bit too much. Not so now, with a little higher VG blend, and better flavor extracts, Moon Sugar is nearly perfect. Every nuance of flavor is there, delivered in such thick clouds of vapor I urge you that if you drive and vape, open 2 windows so you don’t blind yourself to oncoming traffic. Kiera: I’ve always loved Moon Sugar, and I was sad not seeing it around for a while. It’s return, in 100mL bottles for twenty bucks, with a better VG, Nic Salts, and Flavour Art extracts, Gary Riddle recreated Moon Sugar in a way that only made it better than ever. In my daily rotation right now and for as long as I can, this new Moon Sugar is a 5 STAR blend. A fusion of sweet cantaloupe, papaya and mango cut with fresh citrus ​created ​especially for the fruit craving vapers looking for something crafted with a deft hand. All three melons are perfectly mixed to represent everything a melon lover could ever ask for, gifted with a union of ripe, juicy and sweet melons to showcase their finest virtues. Juicy cantaloupe with a refreshing complement of tart citrus, Hawaiian papaya and sweet mango. Julia: I’m always honest in every review. If I wasn’t, I couldn’t do this job. The bad Karma would add up so fast I’d spend the next 100 lifetimes as a rodent. 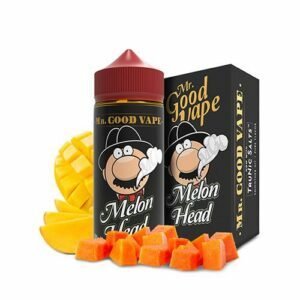 So, I can tell you truthfully that the quality of the new Melon Head is the best I’ve seen from Mr. Good Vape, but the “fusion” of flavors are just so far off my personal flavor profile that I could never add it to my rotation. Tom: Every eliquid company has to create a cross section of flavors to appeal to as many Vapers as possible. Even when you are reintroducing your line 3 flavors at a time, those flavors must be diverse. So, with the heartwarming Moon Sugar you satisfy those that want sweet, home and hearth flavors, and Sweet Lovin you appeal to the candy lovers out there, and with Melon Head you appeal to the fruit lovers. And Mr. Good Vape has done a real good thing for fruity Vapers. This blend is expertly prepared to hit just the right flavor note for each of the fruits inside. Real cantaloupe, papaya, mango, and this semi-tart citrus (is lemon, lime, what? ), is going to be a blissful vape for the right Vapers. Every day that I reach for my Asvape Strider with its dedicated SMOK TFV12 Cloud Beast King, I enjoy Melon Head more and more. That is something I did not expect, but it goes to show that Mr. Good Vape has a handle on flavor creation that very few artists have. I have no choice but to award Melon Head with 5 STARS. Kiera: Melon Head feels like it was blended just for me. I’m a pushover for a good, solid, cloud busting fruity vape that delivers a bunch of flavors in a way that with a slow exhale I can detect each and every one of them. That genuine sweet cantaloupe, the luscious Mango, and yes even the weird papaya, all sitting above a river of citrus goodness makes my head swim in passion filled flavor heaven. Mr. Good Vape is reformulating its entire line of 12 flavors. These 3 are the first, and if this is what we can expect, Mr. Good Vape is going to come back stronger than ever. 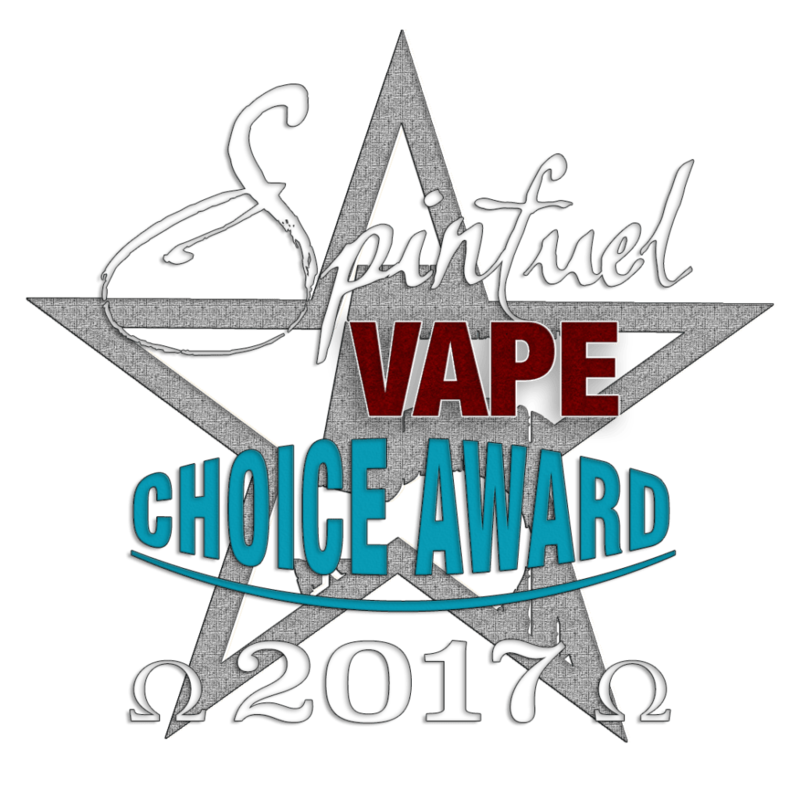 As one of the oldest e-juice lines in the vape market, they recognized an opportunity to rebuild their mighty presence. Gary has told us the reasons for the relaunch. Here are the top reasons. Devices have changed since their official launch in 2012, (Spinfuel’s launch as well! ), and their original line was designed for cartomizers. Yep, our first experience with Mr. Good Vape was using a Carto-Tank we adored from Vape Dudes. The flavor artists at MGV have progressed in their craft a thousand fold, and they have access to the very best extracts and manufacturing facilities in the world. MGV wanted to build flavors that are certified as DA/AP free (Vapers can now scan a QR code on the bottle takes them to the test results for each one). MGV is a leader in the industry and as such felt that taking the right step to create premium liquids without DA/AP will move the vape industry in a positive direction. We think so as well. MGV has rebranded to adhere with www.vapefreeyouth.com’s guidelines. 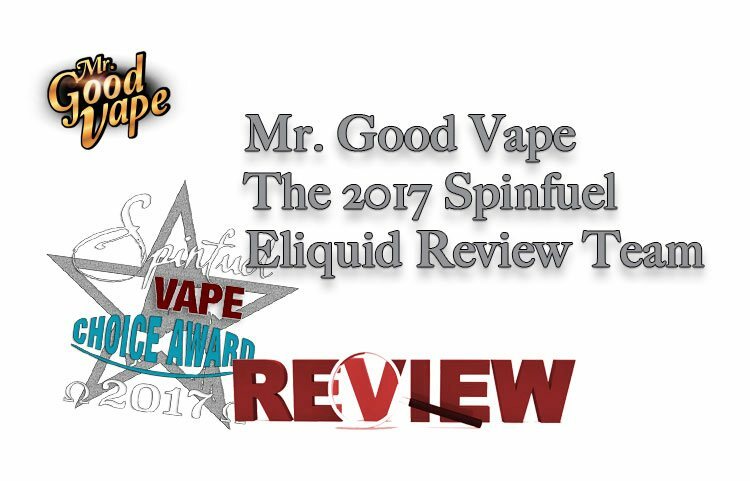 We are so looking forward to the other new reformulations coming from Mr. Good Vape that we’ve told them we’re open for new reviews whenever they are. These guys are the good guys, and their new formulations are incredible, their choice to ship in 100mL bottle and retail for $19.99 is, in our opinion, one of the smartest moves made by any eliquid manufacturer this year.